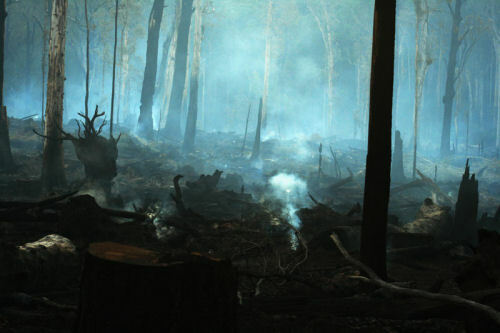 The recent Auditor General's Report on the incompetence of the Victorian Government's wildlife statistics collection and maintenance mean that the Victorian government could not logically have the authority to make decisions about sustainable forestry where local fauna habitat is affected, in the opinion of this candobetter.org writer and environmental sociologist. Because of this, it seems to me that Environment East Gippsland has clearly won its case in advance. It will take years, decades, maybe half a century for the Victorian government to repair its statistical collection. But will the judges be aware of just how bad the government's information is? We have to make sure that they do by making this information so well-known that it cannot be avoided. So please pass the link to the Auditor General's report around. Environment East Gippsland's (EEG) lawyers are working overtime getting the case and expert witness reports prepared for the court case which starts in just over 4 weeks. It will be at the Sale County Court (Supreme Court does regional hearing). EEG people have been offered some accomodation but could probably use more. The case could blow out to over the two weeks set aside for it. The forest-related Acts can be complex so loads of paperwork needs to generated. EEG volunteers are still flat chat trying to raise more funds to ensure they can cover the immediate costs. Meanwhile Brown Mountain’s wildlife is getting around the old growth forests in peace. Volunteers are still maintaining spy cameras trying to get more critters on film. camp here in Goongerah. VicForests response is to say protesters have stopped important machinery from being used for fighting fires. This is untrue. 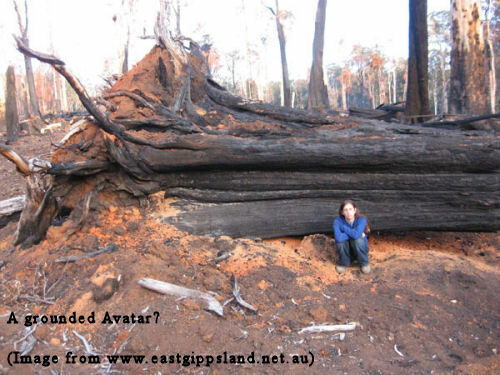 Could I recommend the film Avatar as an example of what our Wildlife and Forest Warriors in Australia are defending and the forces that seek to destroy it? Brown Mountain, as you can see from the photos, has amazing huge trees and is a different and beautiful world. Searching for economic growth through these limpid havens is like searching for Unobtainium. It is a gross act. The very kind and funny actor, Rod Quantock is holding his “Bugger the Polar Bears – this is serious” show at Warrandyte on Sat 20th Feb 7.30. Bless him! Half the profits he raises will be donated to EEG to help with our costs. Tickets $30. Ph: Ingrid 9870 8378 for details. (will send more details soon). To help EEG's marketing and fundraising they would love the help of someone who has a good grasp of Photoshop or other image programs – to put a hand and an old growth forest together on their website. Did we all forget again this year to nominate Jill Redwood and Rod Qantok (along with Julianne Bell, Jill Quirk and Mary Drost) for the Australia Day awards? Try to remember next year. Maybe we should have our own awards. Rod Quantock is holding his “Bugger the Polar Bears – this is serious” show at Warrandyte on Sat 20th Feb 7.30. Bless him! Half the profits he raises will be donated to EEG to help with our costs. Tickets $30. Ph: Ingrid 9870 8378 for details. (will send more details soon). 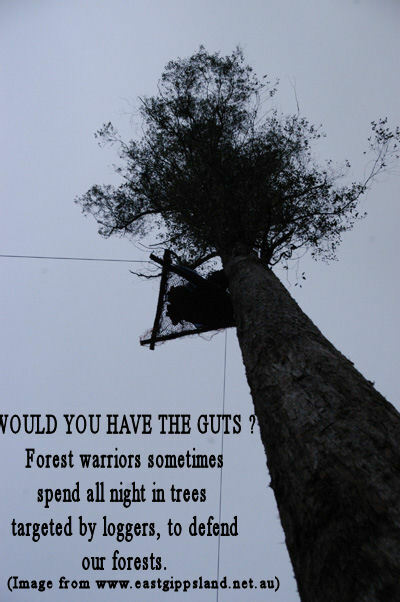 I have for years been in absolute awe of those who put their own bodies on the line to protect our forest and wildlife heritage by standing in front of bulldozers or sleeping atop trees. Of course their actions are not exaggerated when we see what is at stake and the pictures of the destruction. Ideally we'd all occupy these places and stand in the way of the destruction but the sacrifice is too great for most of us. Rod Quantock's contribution to preserving our environment through his talents is also awesome. Oh, I don't know that it would be so hard, Quark. What if, instead of marching down Swanston Street about global warming, next time the thousands of Climate Change activists come down and stopped the bulldozers. That would make them sit up in Spring Street. Two hundred people would do it and would be hard to arrest, but better one thousand people working for Jill Redwood than Al Gore. One thousand Global Warming Activists in the forests could stop logging in Victoria forever. Aim for 10,000 people working on roster and we would finally have a functioning environmental movement and something for Australia to be proud of, rather than a handful of weary, stretched to the limit people fighting for all the rest of us 600km away. Such a movement could lead a complete environmental reworking of our economy. WE cannot rely on the Greens or anyone else - and certainly not on the government. We have to rely on OURSELVES. Get in touch with Jill Redwood via the EEG website and volunteer your bodies as Avatars for a series of final showdowns with the woodchipping vandals who partly run the Victorian government. Save a place for me!